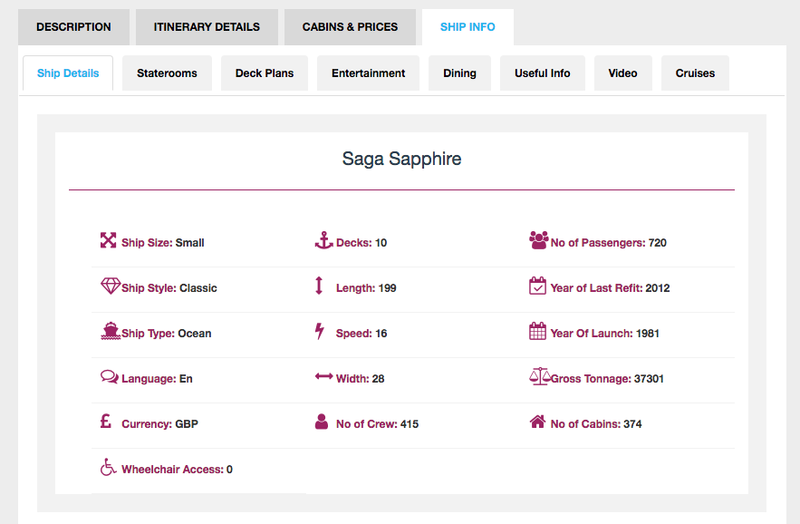 In October, Widgety went live with the full integration of cruises, pricing and availability from Saga Ocean Cruises. Added to our brochures and existing ship content for the brand, including a new ship for 2019 and another planned for 2020, a travel agent now has everything they need to start selling the line to customers. 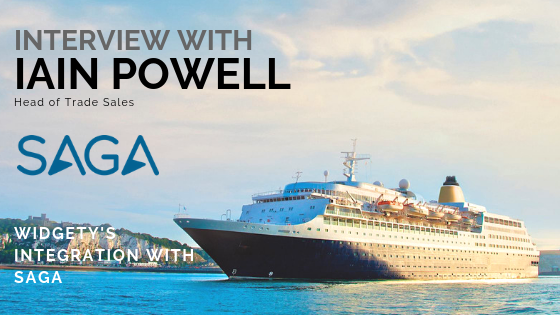 We spoke to Iain Powell, the Head of Trade Sales for Saga Travel, to find out how the integration works for them and how the cruise line are expanding over the next few years. 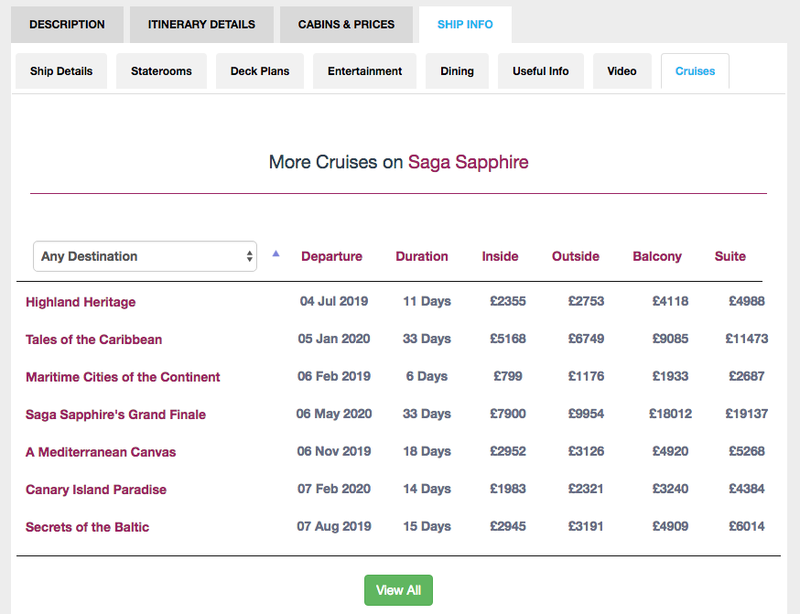 What does Saga plan to achieve in the UK with travel agents, and how does adding in your ships, itineraries and pricing to Widgety feature in those plans? We have set out very stretching targets for the growth of trade business for Saga Travel over the next 5 years, with trade becoming a key distribution channel for us. Working closely with Widgety is a key element of this, as it allows us to share content with a significant group of travel agents in a quick and easy way. We have two new ships on the way and showcasing them to as many people as possible is ultimately the key objective; Widgety helps us to do this. What is the advantage to you of an integration with Widgety, and why have you partnered with us? I believe there are two key advantages for us of this integration; 1. Ease of use and the amount of time it saves us and 2. The broad reach Widgety now have across the travel agent community. For us to provide this many agents with our content individually would be a very laborious task; this just makes it so much easier. How do you plan to use the new integration with Widgety within your own team? Our regional team are now using the search function for our own product to display content quickly and simply, when visiting our agent partners and working at travel shows. Having such a broad range of content at their fingertips is hugely beneficial for the team. Enough about us, in your experience of the industry, what’s the biggest barrier a travel agent faces when wanting to sell a cruise line? I believe it is often a lack of understanding of either the sector or the cruise line in particular. To be able to sell a cruise effectively, you have to really know the product, as many cruise customers will have already done their research. Navigating the range of cruise lines, itineraries, cabins etc can be quite daunting for a travel agent, when they are first venturing in to cruise. You have several different fare sets for the cruises, what are the key points for an agent to understand when selling Saga cruises? Our pricing is actually very simple, with just one price for the customer. That price does however move, as with all cruise lines, but the key difference with us is our price promise. Within this we guarantee no customer will pay less than someone booked before them and if they do, we will give the customer back the difference. This means we start with our heaviest discounts early on, then the price increases as we get closer to departure. It’s a perfect model for an agent and customer, as they know that if they book early, they are getting the best deal. Are there any key dates travel agents should be aware of when new itineraries are released and big changes in pricing happen? As mentioned, our pricing is very well managed and I would therefore just encourage agents to book their customers as early as possible. In terms of key dates, we have a few to note; 19th November 2018 is when our second new build, Spirit of Adventure, goes on sale. She comes into service in August 2020. Spirit of Discovery is already on sale (our first new ship) and she comes into service July 2019. So lots of exciting things to look forward to for us! What trade resources are available to a travel agent to help them sell Saga cruises? We try to make selling a Saga cruise as simple as possible for an agent. We have a dedicated team of 6 on the road, who are out there delivering training, attending events and store visits, all to help improve the knowledge of our agent partners. We have launched a new trade website, where agents can not only make bookings for any Saga Travel product, but can also download offers, window cards, point of sale merchandise and so on. We’re also now working on revamping our training platform, Saga Experts, to ensure that agents can come on and learn about our product at their own leisure. How does a travel agent start selling Saga cruises, and who do they get in touch with to do so? The first port of call, to begin selling Saga Cruises, should be either our agency sales team or, if relevant, your consortium head office. Either way, we can then go about getting you set up on our booking engine and ensuring the right contracts are in place. Beyond this, we would assist with a regional sales team member contact; from there, you’re good to go! The over 55’s is the largest growing demographic on Facebook, how important is social media for talking to consumers and building your brand? What about for talking to travel agents? Social media is hugely important to us. All of us have to be careful not to fall into the trap of presuming the over 50’s market, which we of course target, isn’t using social media to engage with brands. As you say, they are the largest growing demographic and we are increasingly trying to tap into this, building a Saga community online, where guests can interact with us as well as each other. I would argue that, for us communicating with travel agents, it is even more important. Agents are bombarded with industry news, offers and incentives every day – we want to find ways to communicate with them in a media they are comfortable with and already using – social media is perfect for this. You have new ships being launched in the next few years, what makes them different to others in the market? Our ships are very different to what has become the norm in new builds over the last decade. We are the only cruise line building smaller ships (under 1000 passengers) specifically for the UK market. They will have a boutique luxury feel to them and take Saga to a totally new level of ex-UK cruising. We know what our demographic wants from a cruise line and we believe we are building exactly that; something which will suit our loyal Saga passengers as well as attracting newcomers to the brand. What else does Saga have planned for the future? At the moment our primary focus in cruise, is delivering the two new ships we have coming in to the fleet in 2019 and 2020 (Spirit of Discovery then Spirit of Adventure). Of course I personally would love for us to continue building this unique type of cruise ship, but first we have a big job to do and our success with filling the new ships will undoubtedly determine the likelihood of future builds. What is your favourite thing about the cruise industry? A couple of key things stand out for me in this industry. Firstly, the people who work in it. I feel extremely lucky to be in an industry with such passion for the product; I genuinely think this is quite unique to Travel, but even more so to Cruise. We all get along exceptionally well, no matter which cruise line you work for and there is a collective ambition to grow the industry. The second thing I love is the innovation. Almost all major cruise lines are currently building new ships and I love to see the new ideas and designs which teams are coming up with, all catering to a slightly different part of the market. The use of technology onboard cruise ships has exponentially grown in the last few years – I’m excited to see what’s next! Thanks so much for talking to us Iain! Remember to keep an eye out for cruises on the new ship Spirit of Adventure, which go on sale on the 19th November 2018. Agents will be able to find every itinerary, cabin grade and all the ship information in our API and Cruise Search as soon as they are released.